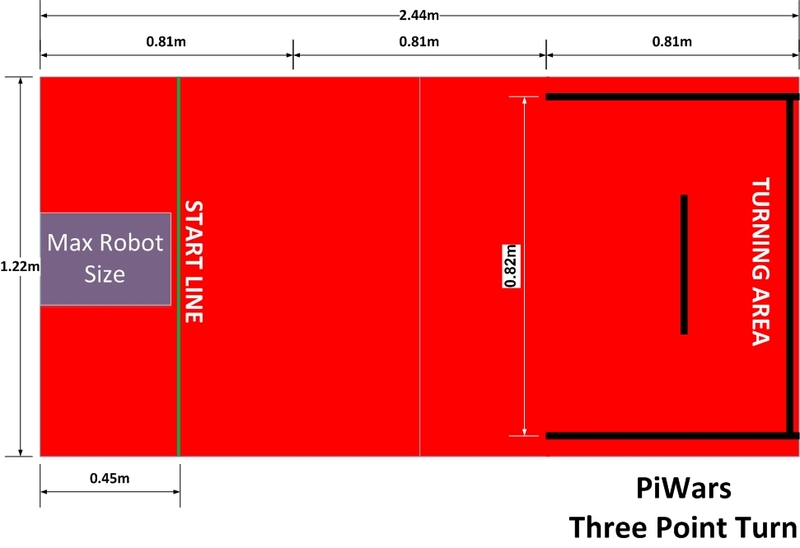 The robot must be autonomously programmed for this challenge which takes place inside a course measuring 1.22m by 2.44m with various markers. A picture of the course is shown on the right (click for a larger version). start in the middle of the course surface, behind the white "start line". proceed forward and cross the second white line ("CROSS THIS LINE"). turn left by 90 degrees (either on the spot or in-motion). drive forward and touch or cross the 'top' black edge line. drive backwards in a straight line and touch or cross the 'bottom' black edge line. drive forwards to the middle of the turning area. turn left by 90 degrees. return to the starting box. The measurements of the course as shown in the diagram are correct and will be measured as such when the course is marked out. 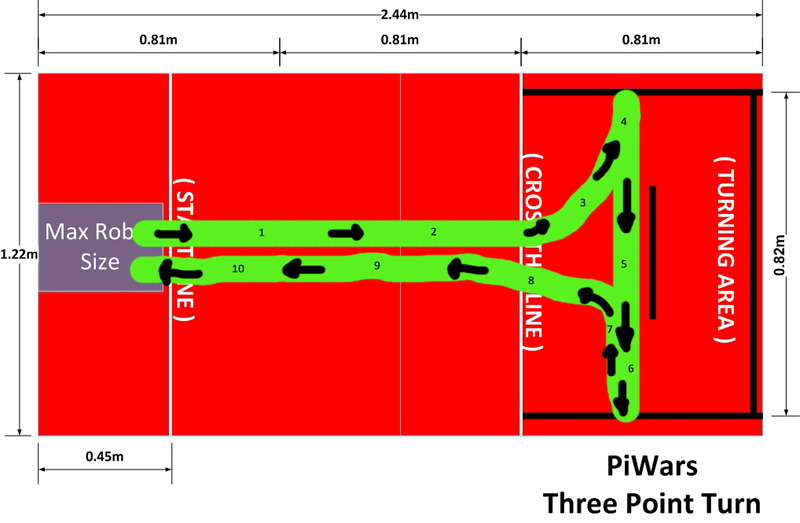 The distances of travel required within the turning area will, of course, vary according to the length of your robot - it is up to you to prevent it from leaving the course surface. 10 points will be awarded to any robot that finishes the three-point-turn successfully and completely crosses the white start line on its return. 20 points will be awarded for any robot that finishes the three point turn successfully and finishes with any wheel inside the starting box. Any rescue of the robot will incur a 20 second penalty. Only 2 rescues are allowed before the challenge is abandoned. If the robot's wheels go beyond the perimeter of the course, this will incur a 15 second penalty in addition to the 'rescue' penalty. Will the green start line and the red line be detectable lines on the course? I assume the black line in the middle of the turning area is 0.37m in, is this correct? How far in from the boundary are the two black lines at the edge of this area? Looks like a fun challenge! That’s correct on the 0.37m – it’s slap in the middle of the ‘third sector’. The two short black lines in the third sector towards the outer edges weren’t measured last year, but if it helps they were about 10-15cm in. It certainly proved to be on of the most interesting challenge last year – autonomous operation is very challenging! If the robot is capable of sidestepping, is rotation of the robot required to pass this test? Is the course going to be red as in the picture? Going to check that and get back to you. Could you clarify which line is the red line please? Is it the first dimension at 0.81m from the left or the halfway dimension at 1.22m? Or the start of the second 0.81m line? Hi Mike. Apologies. I think me and Tim have our wires crossed on colours. I’ll get back to you with clarification. Any news on the red line location? Working it out tonight. Likely to be a white line. Red line on red paint? Not a good idea. So, for clarification…. Is this sort of what is required? It’s okay, David. Three Point Turn is always a bit of a mind-bender. I’ve changed the description and the diagram of the course to make it clearer. Your diagram is not correct. You’ve turned right at the top when you should turn left. That makes it loads clearer – going to be a tricky challenge this one methinks. Thanks for clarifying the red line issue. 2) Additional points also state “20 points will be awarded for any robot that finishes the three point turn successfully and finishes with any wheel inside the starting box.” Could you explain how the Starting box is marked out please? A Black tape outline? A purple rectangle as shown? How big is it? Argh. That’ll teach me for not reading the whole thing. Will clarify. 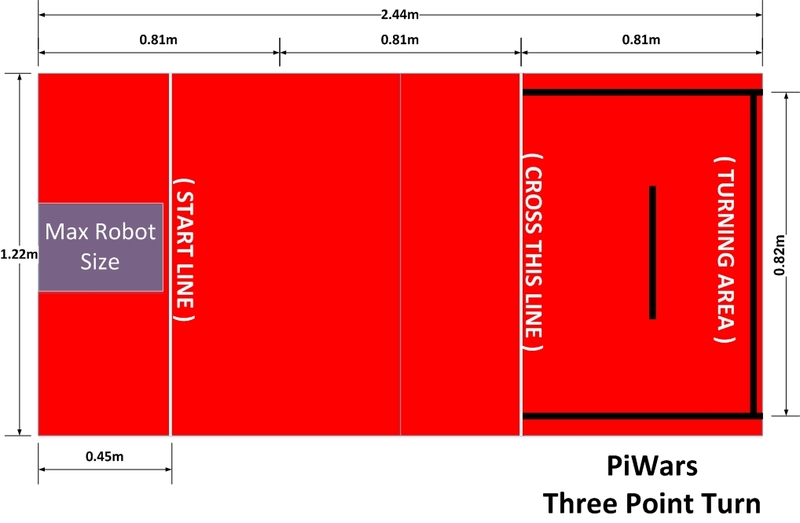 Can you confirm if there will be walls around the course, to enable the use of a distance sensor to assist the robot? Sorry if this has already been asked. There is no wall around it. It’s flat. Sorry Mike. Just a final clarification. After the first turn the robot moves forward to touch or cross the top black line. Am I right if I assume that if part of the robot extends beyond that line then that counts as crossing it? i.e. If you look at the robot from above the front has gone beyond the line.